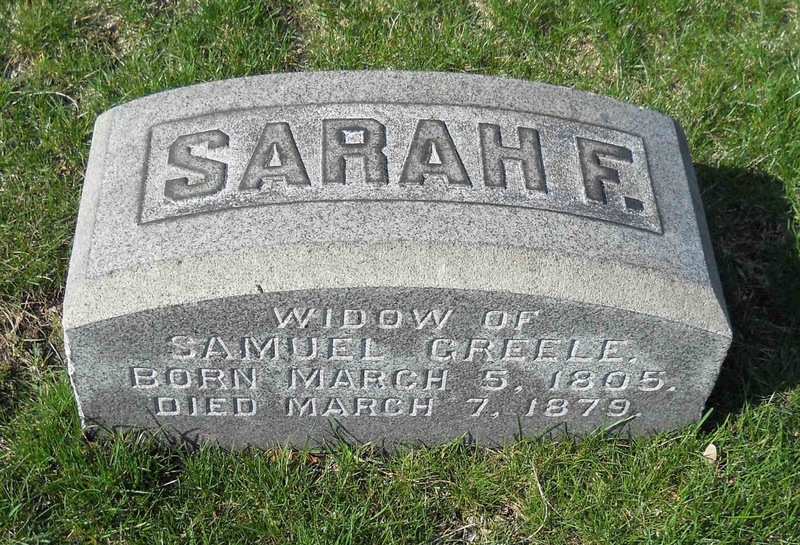 In my last post, I noted that my third great-grandfather Samuel Greele (1783 - 1861) had four wives. 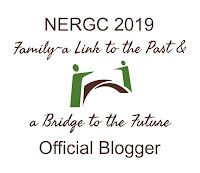 This is documented in the Greely-Greeley Genealogy (page 303), as well as in an obituary for Samuel Greele in the New England Historical and Genealogical Register from 1861 (pp. 360-361). These secondary sources provide details about his first three wives and note that he is survived by his fourth wife, the former Sarah Follansbee Emerson. Newburyport, Essex County, "Massachusetts Vital Records to 1850." Marriages, Vol. 2, p. 196. "Massachusetts, Marriages, 1841-1915," index and images, FamilySearch.org. Record for Samuel Greele and Sarah F. Emerson, 1844, left hand page. Record for Samuel Greele and Sarah F. Emerson, 1844, right hand page. Each of these note that Sarah F. Emerson or Sarah F[ollansbee] Emerson married Samuel Greele on October 8, 1844. She was not quite 40 and he was just over 60 years old. I have spent a bit of time in the past trying to confirm when and where this Sarah (Emerson) Greele was born and died and have had no luck. Although it is said she is from Newburyport, I couldn't find an Emerson birth record for her. 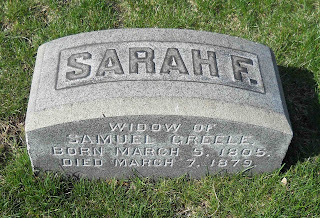 I recently obtained the plot card for Samuel Sewall Greeley's family plot at Graceland Cemetery in Chicago, Illinois, and included on the plot card is an entry for Sarah F. Greeley, died March 7, 1879, age 74. At first I didn't know who this was. And then a kind Find A Grave volunteer (thank you Bob) provided a photograph of the stone. Newburyport, Essex County, "Massachusetts Vital Records to 1850." Births, Vol. 1, p. 143. Sarah Emerson Follansbee, daughter of Thomas M. and Hannah Follansbee, born on March 5, 1805, in Newburyport, Massachusetts. From these clues (which are not exhaustive - I could do a lot more research on the Follansbee family, as well as find a death record in Illinois for Sarah F. Greele), I would deduce that Sarah Emerson Follansbee is the same as Sarah Follansbee Emerson, and she is buried with her step-son (Samuel S. Greeley), step-daughter (Louisa M. Greeley), and extended family in Graceland Cemetery in Chicago, Illinois. This explains why I find Sarah Greeley, age 64, born in Massachusetts, boarding with Amos and Harriet Noyes in the 1870 U.S. Census in San Francisco, California. A little more digging and I find that Harriet was born a Follansbee to Thomas and Hannah and married Amos Noyes in Newburyport. 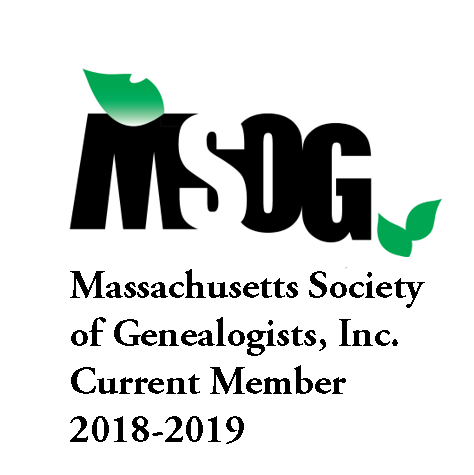 I am so happy for your success. This gave me goosebumps reading how the mystery became less of a mystery. Yeah! Devon, thanks for reading and sharing in my excitement! Tombstone Tuesday ~ Who Was Mary Eliza Wells?